Today, we join you from the very east of our borders, from the Kingdom of Gostor, a relatively young Kingdom, but far from the youngest. It is here that we have witnessed something rare indeed: a Kingdom that has set aside their differences in order to strengthen not only themselves but their entire Kingdom as a whole. Typically, especially in the younger lands, we witness a barbaric state, where madness runs most people’s day to day lives and warfare is a constant struggle that all must suffer through. Yet, in Gostor things appear to be different, at least for now. The reasoning for this can largely be attributed to the Lords who rule over the lands and thus enjoy the luxury of sitting on the seat of power, the Eternal Stronghold. 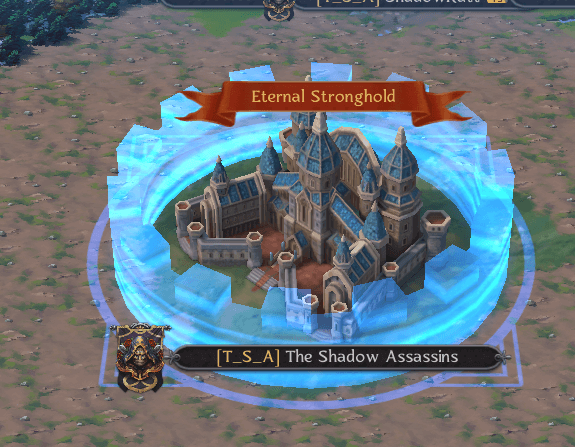 As can be seen from the above image, The Shadow Assassins are the Order of which I speak, and despite their name, they are an honorable group of warriors, respecting all others in their lands, as long as the proper taxes and respect are returned to them in kind. This Order is ruled by the one and only Tony Tiger, who possesses an impressive commanding force of soldiers and influence. 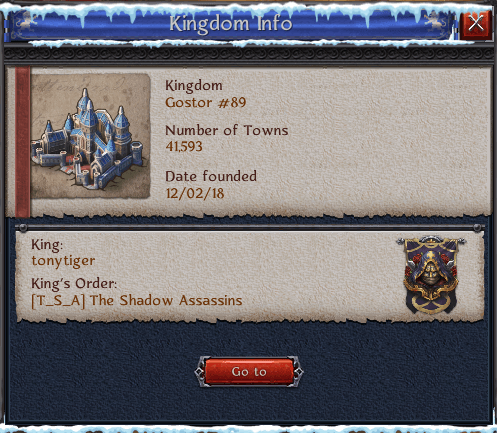 Leading by both action and charisma, Tony Tiger has made it The Shadow Assassins mission statement to help the Kingdom as a whole, intending that they grow collectively, rather than alone. 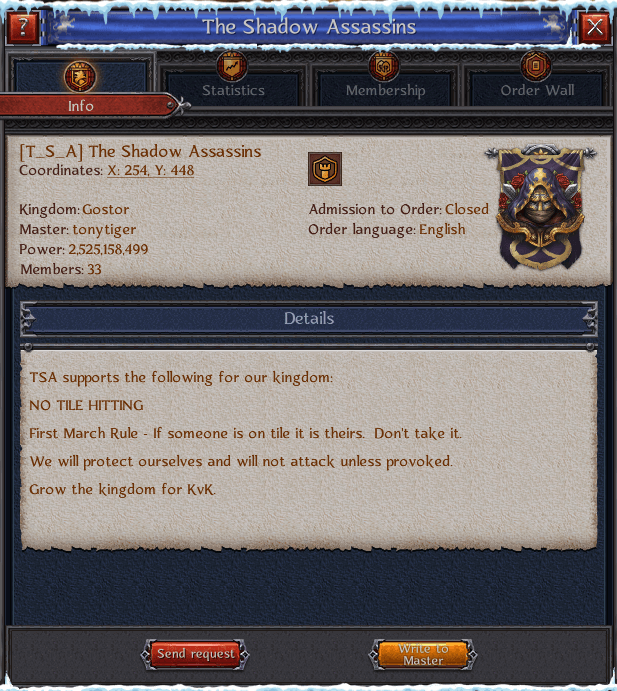 By adopting this mentality, and through the sheer overwhelming strength that the Shadow Assassins possess over all other Orders within Gostor, they have allowed the Kingdom to match enemies much older than even they themselves, as pointless battles have been greatly reduced and any upstart rebellions have been quickly stamped out. This path that Gostor is on seems promising, and barring an internal breakdown that results in infighting within the ranks of The Shadow Assassins, it appears that their rule, at least for now, is absolute over the lands in which they reside. Their strength matches numerous other Orders combined. 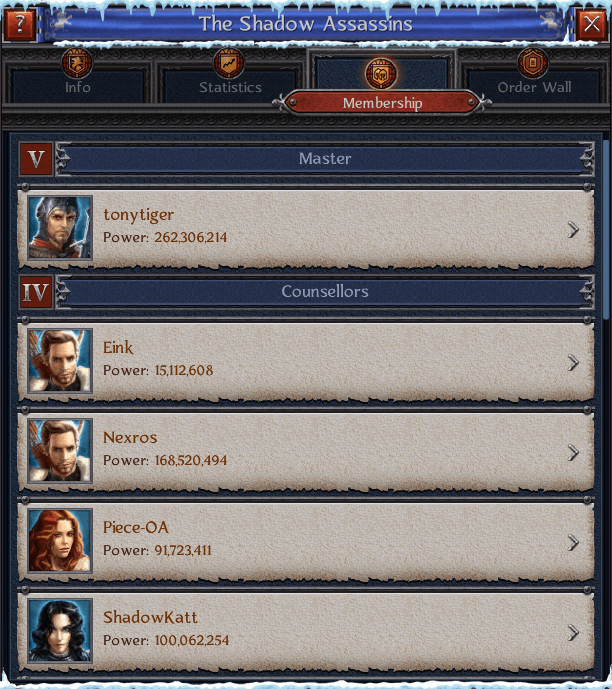 This means that Gostor will continue to grow and flourish, led by capable and strong leaders, enabling them to take on all would-be challengers and foes that they are soon to face in their first of many trials to come: the Kingdom vs Kingdom war.